One of Becky's equine clients releasing tension in his Poll. Saddle Fit with an Infrared Camera shows asymmetry and pressure points on the right. You want the best for your horse. At Equine BodyWorks, we do too. Whether you and your equine athlete are competing at the highest levels of equestrian sport or are hiking buddies hitting the trails on weekend rides, your goal is A Horse Performing at Its Best™. Becky Tenges, owner of Equine BodyWorks LLC, is dedicated to supporting you in that pursuit through Infrared Thermal Imaging, Integrated Equine Performance Bodywork™, and Saddle Fit Services. We offer a comprehensive approach to assessing, improving and assuring your horse's well-being through cutting-edge diagnostic technology, results-oriented bodywork and world-class saddle fit methodologies. At Equine BodyWorks LLC, we integrate knowledge and expertise gained from the world’s top equine industry professionals in Thermal Imaging, Performance Bodywork and Saddle Fit. Equine BodyWorks LLC is owned and operated by Becky Tenges, MMCP, CET. 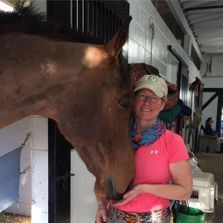 Learn about Becky and her passion for improving the well-being of horses and supporting you with information and answers here. Becky is dedicated to equine evaluations and therapies that help horses by Revealing Afflictions; Reducing Discomfort; and Improving Movement and Performance. In her dedication to the health and well-being of horses and to assisting owners and trainers in their pursuit of A Horse Performing at Its Best™, Becky is in a constant quest for world-class knowledge and competencies to best serve her clients. Becky Tenges with a happy client.